Williams-Sonoma offers a wide range of products and services at incredibly low prices in Australia. 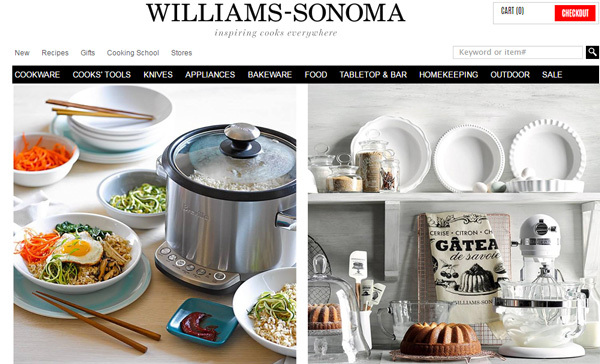 These Williams-Sonoma promo codes expire soon, so don’t forget to bookmark this page now. Limited time Williams-Sonoma coupon: Selected food items are available with flat 20% discount from Williams-Sonoma. Go for this offer before it runs out. Exclusive Williams-Sonoma voucher codes: Purchase knives & save up to $560.05 on your order from Williams-Sonoma. Buy now to save more! Seasonal Williams-Sonoma deal & sale: Save $10 on purchasing all-purpose fan by offered by Williams-Sonoma. Click here to get instant savings. Latest Williams-Sonoma promo code: Williams-Sonoma brings to you a fantastic offer in which you'll get Kuhn Rikon Watermelon knife worth $32 for only $18.95. Williams-Sonoma was founded by Chuck Williams in 1956 with one aim – to inspire cooks all around the world. Even though the first store of the company was opened in the small city of Sonoma, Chuck Williams already had big plans for it. When the first store opened up, it had a very small collection of kitchen equipment and cookware that were imported from France. But 60 years later, the company has grown tremendously, they now provide a wide range of kitchen products from all around the world. Purchase kitchen, cookware, bakeware and storage essentials available with free shipping and huge savings at Zanui. Select all the products that you want to buy and add them to the shopping cart. Choose a coupon code and make sure it fits the products you are about to buy. For instance, if you are buying bakeware, then try finding codes that provide extra discounts on bakeware. Go to the Williams–Sonoma website’s checkout page and paste the coupon code there. The total amount should now get deducted. Save some money on redesigning your home by redeeming vouchers listed at home & garden section on our site. Williams–Sonoma shares extremely helpful DIY cooking tips on their YouTube channel. They also upload promo videos of their latest product launch. Check out this video on how to churn ice cream using their latest product Open Kitchen Ice Cream Maker. For all the orders below $99, a flat rate of $14.95 is charged, depending on the location, orders are either shipped through Australian Post or other freight partners. The orders need to be signed on delivery, that is why, if no one is available to receive the order, a slip will be left and delivery will be attempted again the next day. Williams–Sonoma does not ship to PO Boxes. For orders above $99 delivery is free. Deluxe delivery is available for oversized products which are delivered through freight partners. All the products, including furniture are pre-assembled and they are ready to be used. Delivery time for Deluxe order is 7-10 days. Sometimes orders might be out of stock and in that case customers will get a call about the delay. Delivery to Sydney, Melbourne and Brisbane takes 1-3 business days while it can take up to 7-10 business days for rural areas. For the furniture bought from Williams–Sonoma, refund can be asked within days from the date of delivery, while a 30 day return period is provided for all the other products. In case of furniture, there will also be a 20% restocking fee. The original recipients need to be provided at the time of returns. Items bought through gift cards can be returned but the amount will be refunded back to the gift cards only. Gift registry items can be returned within 90 days of the purchase date. No returns are applicable to customized or monogrammed products. To process a return, the customers need to call up the customer support first. Damaged products need to be reported immediately so that they can be duly exchanged. 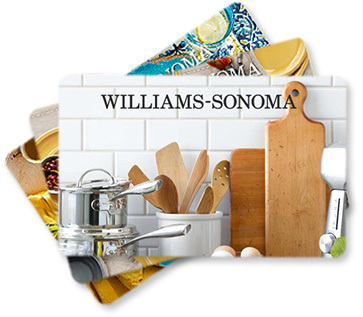 e-Gift Cards can be bought from the official Williams–Sonoma website. They can either be emailed right away or a special date can be selected for them to get delivered. The order amount can be anything between $25 - $250 AUD. At a time, a customer can buy multiple cards but the total order value should not exceed $1500 AUD. Customers can choose any one of the images for the card and write a personalized message along with it. Apart from Williams–Sonoma, these gift cards can also be used at Pottery Barn, Pottery Barn Kids, and West Elm. Customer Support by Williams–Sonoma is available 7 days a week and they can be contacted through phone and email both. Customers can directly email their queries or call their toll free number. The support team is available for help between 8am to 9pm AEST. Williams-Sonoma has a grand presence on all the major social media platforms.